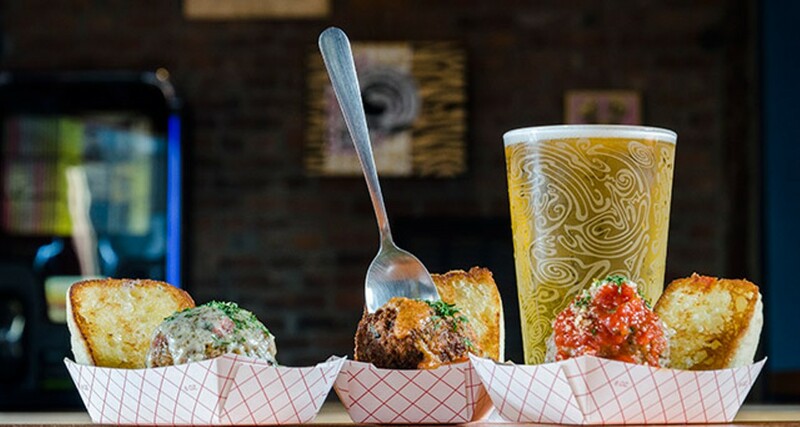 PHOTO BY MARK CHAMBERLIN Meatball sliders from Skylark Lounge. Would you like to get all gussied up and treat yourself to an expensive gastronomic feast, complete with wine pairings and decadent, show-stopping desserts? If so, you can take your top hat and monocle elsewhere. This rundown of Rochester's cheap eats is for hungry people who don't carry their money around in sacks with dollar signs on them. Whatever these places lack in caviar service and fingerbowls they make up for in value and nourishment, and usually that's all you need. The only shared criteria among these establishments is that they have meals with a price point at or under $10; otherwise, this list is as random as can be. So if you have a favorite place to get tasty, inexpensive food, please share it with us at rochestercitynewspaper.com, or hit us up on Facebook (facebook.com/CityNewspaper) or Twitter (@roccitynews). Barry's Old School Irish (2 W. Main St., Webster, 545-4258, barrysoldschoolirish.com) is what you get when you cross a pub with a café and bakery, and it's a cozy place to get traditional fare like bangers and mash ($8) and a full Irish breakfast ($6.50), along with a satisfying Rochester-Dublin hybrid like the Sheepdog ($8), which beds a Zweigle's red hot in a bun and then blankets it with shepherd's pie. (For dessert, the Guinness layer cake is outstanding.) And if you're thirsty, Barry's features the area's largest selection of Irish whiskeys. It probably serves water, too, if you're into that sort of thing. Hopefully area vegans will forgive a mention of Natural Oasis Café (288 Monroe Ave., 325-1831, naturaloasisny.com), because you just can't make a list of Cheap Eats in Rochester without including this wickedly creative eatery. There are typically 13 items on the dinner menu, each a different daily preparation of dishes like stew, pizza, gnocchi, and greens, plus an Ethiopian selection, a drink, and a couple desserts. One recent visit, for instance, featured a brown-rice risotto with roasted cauliflower, oven-dried tomatoes, pesto, and pine nuts, and a sublime salad of lettuces, roasted beets and carrots, pistachios, and truffle vinaigrette. You forget that you're eating vegan, and you don't care anyway because each delicious dish is $4. FOUR FREAKING BUCKS. Really. Consistently reliable and seemingly always open, Ming's Noodles and Cuisines of Asia (1038 S. Clinton Ave., 244-0985, mingsnoodle.com) has expanded its menu quite a bit over the years to include Vietnamese and Thai dishes, and nearly everything on it is under a 10 spot. The lunch combos will run you $5.25, with dinner clocking in at a couple of bucks more, and the customizable noodles are an excellent bet. I'm a longtime fan of the soba tofu noodle soup ($6.50), which includes buckwheat noodles, bright veggies, and big chunks of tofu: filling, warming, and quite guiltless. A vegetarian combo platter from Sultan Lebanese Restaurant & Bakery. 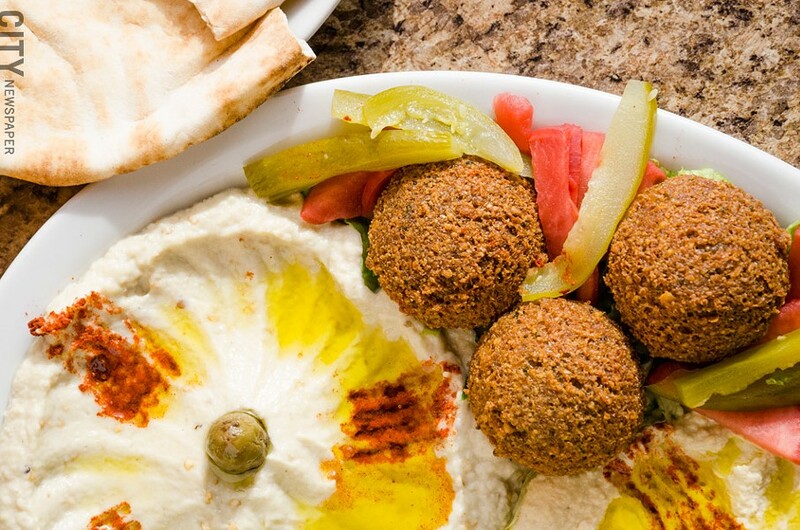 New on the Rochester food scene, Sultan Lebanese Restaurant & Bakery (1659 Mt. Hope Ave., 241-0081) is one of only a few places in town where you can get the vertical rotisserie meat shawarma, available in pita combos with chicken ($5.49) and beef ($5.99). You non-carnivores are covered, too; besides many differently topped versions of the popular Lebanese flatbread manakeesh (all less than $5), Sultan does a good-sized vegetarian combo ($9.99) with hummus, baba ghanoush, tabbouleh, falafel, and more. The Colon Kicker sub, with capicola and steak, from Calabresella's. You'll get some of the friendliest service in town at Calabresella's (1386 Buffalo Road, 235-7860, nystyledeli.com), though who wouldn't be in a good mood around all that mouthwatering deli food? 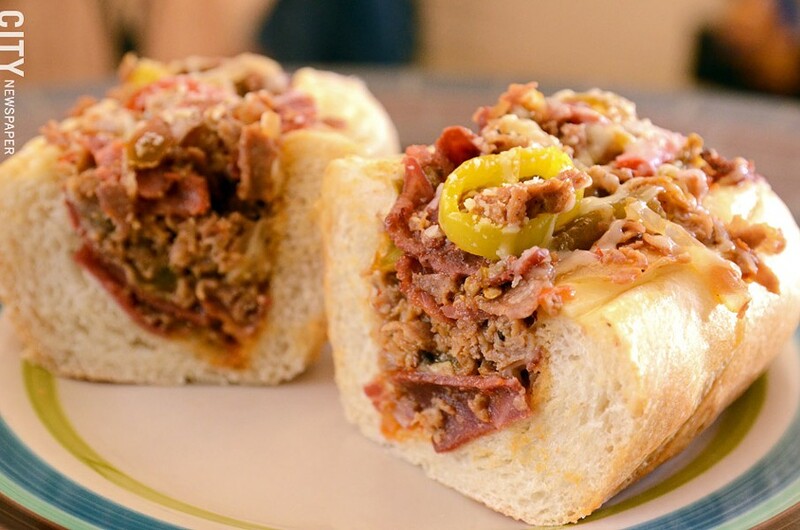 Calabresella's is known for its subs, and the Colon Kicker ($7 for a large), with grilled capicola and steak, might be the most famous of all. Lots of people just hedge their bets with an Italian Assorted ($6), but if there were a Dayna, it would have roast beef, lettuce, onions, tomato, mayo, and hot peppers. It'd cost $6.50, and it'd kick your hangover to the curb. The Sandwich Bistec at James Brown's Place. One of the awesome things about James Brown's Place (1356 Culver Road, 288-4250, jamesbrownsplace.com) is that you can get anything on the menu at any time, perfect for anyone craving a huge frittata or some French toast for lunch. But maybe you're not the short-stack type; no one's going to stop you from enjoying an early-morning po' boy or a 9 a.m. 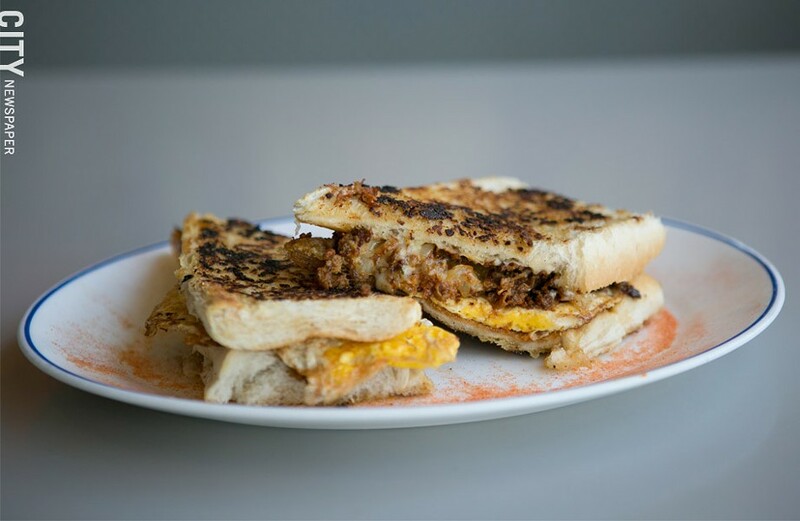 Sandwich Bistec ($6.99), which is Spanish beef, fried egg, sautéed onions, swiss cheese, and garlic mayo on French bread. The menu is massive, with only a few items going past the $10 barrier, and fans of well-done fries will be thrilled to know that James Brown's Place understands what that means. Agave (2820 W. Henrietta Road, 270-4376) isn't hard to find, but it doesn't exactly jump out at you either, and lovers of Mexican food might be annoyed at me for spilling this well-kept secret. The cheap lunch combos are the midday way to go, and some still come in under $10 even with the additional $1.99 tacked on after 2 p.m. At dinner, the soft chimichangas are a deal: $9.99 for two meat-stuffed burritos topped with guacamole, sour cream, lettuce, and tomato, served alongside beans. And since they're not fried, you can feel free to honor your restraint with a top-shelf margarita. 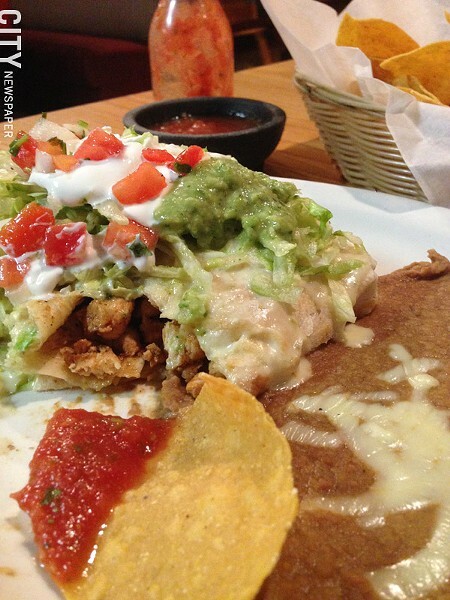 Soft chimichangas at Agave in Henrietta. The South Wedge's loss was Gates's gain when Rohrbach's Brewpub (3859 Buffalo Road, 594-9800, rohrbachs.com) lit out for the west side, but that doesn't mean you city folk have to go without its famous Seven-Lily Soup ($5.50) or German specialties like the Pork Schnitzel Sammie ($7.95), which tops a big plank of pork cutlet with sauerkraut and muenster then tucks it into a freshly baked roll. (German potato salad on the side? Sure!) Burgers, sandwiches, salads, and plates are all nicely priced as well. The catering arm of BBQ Fred Hoggin-It-Style (610 N. Greece Rd., Hilton, 392-7839, hogginitbbq.com) is in enough demand that the actual restaurant is currently only open Thursday, Friday, and Saturday evenings, so that should be a clue that this place knows 'cue. If you're anything like me, you always opt for a quarter rack of ribs with two sides ($8.99). But there are also $8.99 burger combos (the Fred, for instance, is gilded with smoked roast beef, while the Mac-n-Cheese is topped with...you know) and $7.99 plate options, with the usual suspects all available, along with options like Cajun corn and sweet potato fries. At nearly every sub shop, you have the option to build your own, and DiPisa Old World Submarines (196 Court St., 232-6220; 362 State St., 454-3850, dipisa.com) is no different. But these people are pros; why not let them guide you? DiPisa's has a roster of interesting Italian-inspired subs like the Melanzane Vegetariano ($6.99), with grilled breaded eggplant, roasted red peppers, mozzarella, sautéed mushrooms, baby greens, tomatoes, and pesto mayo, and the Mondo Siciliano ($6.99), filled with prosciutto, capicola, hot soppressata, provolone, lettuce, tomatoes, onions, black olives, and vinaigrette. 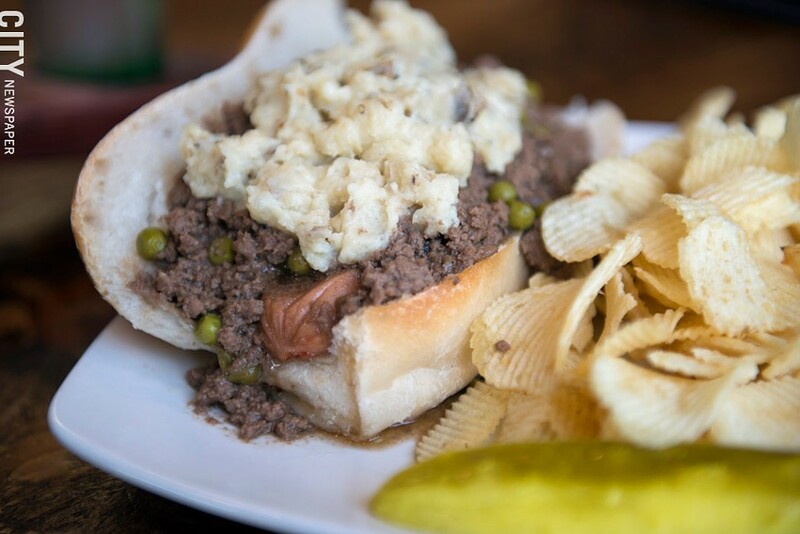 And all the sub rolls are baked in house, so you know DiPisa's ain't foolin' around. 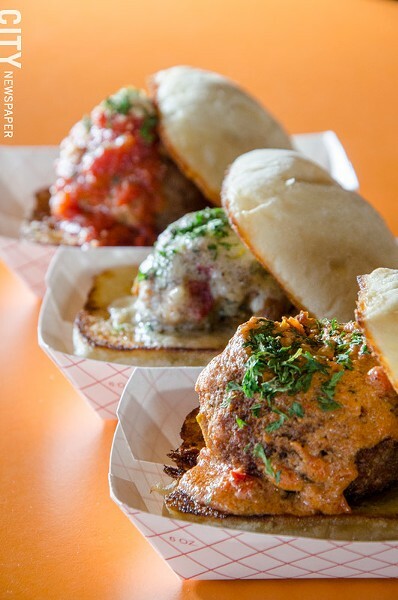 A trio of meatball sliders — pork sausage, chicken, and vegetarian — with sauces from Skylark Lounge. The miso ramen from Tokyo in Henrietta. Open since 1988, Tokyo (2930 W. Henrietta Road, 424-4166, tokyorestaurantrochesterny.com) might be the oldest sushi bar in town, and you can certainly score bento lunches, as well as many maki rolls, for under $10. And as much as I love sushi, Tokyo is my go-to place for ramen. The miso ramen ($8.25) is available on a scale from a nicely spicy 1 to a face-melting 7. 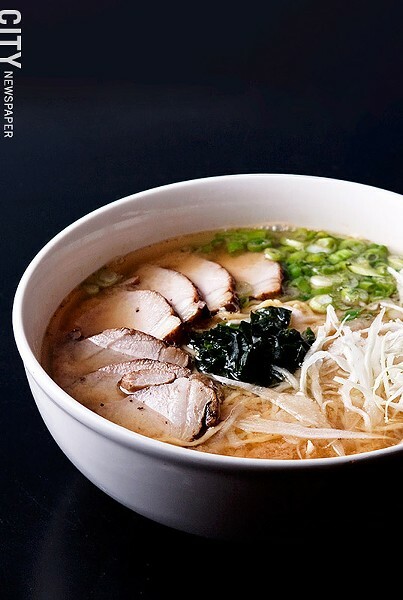 My favorite is the shoyu ramen ($7.95), a sweet, salty, and rich broth loaded with pork, seaweed, fish cake, and noodles. Add three dumplings and make it a shoyu ramen combo for $9.95. Meatballs. That's what Skylark Lounge (40 S. Union St., 270-8106, theskylarklounge.com) serves, in various styles and combinations, often with a side. You got your traditional balls, along with pork sausage, spicy chicken, and a veggie version made from eggplant. The sauces run the gamut as well, from marinara to alfredo to pesto and beyond. Get away super cheaply with a $2 slider, or live it up with three balls and one side for $7. Now, one of those sides could be the amazing deep-fried mashed-potato balls, but if you want to go a little less sleazy (and a lot less spherical), choose cole slaw, or roasted veggies, or whatever special Skylark has cooking. Outlaw Potato sounds like a really funny Halloween costume, but at Texas BBQ Joint (122 S. Union St., Spencerport, 352-4227, tbjny.com) it's a genuine meal, a baked spud topped with butter, sour cream, bacon, cheese, chives, and a big pile of barbecue beef, pulled pork, or barbecue chicken for $7.99. The Wrangler platter is $8.99, allowing you to choose one of nine meats (think beef brisket, smoked turkey breast, etc. ), plus two sides, including fried okra, hush puppies, and broccoli-n-cheese. The sandwiches are all priced at around $5, and adding a pair of sides for $3 means you're still cheap eating! 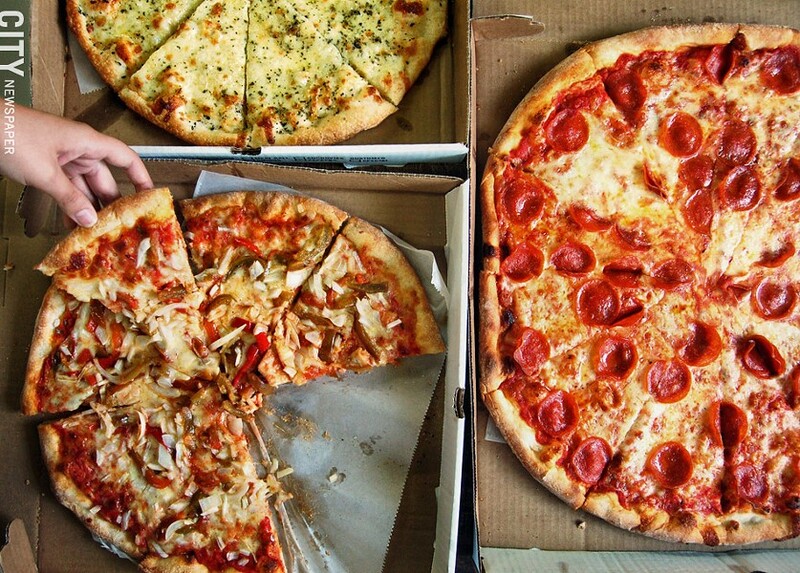 Pick up a slice from The Pizza Stop. Obviously a slice of pizza is the ultimate in value eating, and The Pizza Stop (123 State St., 546-7252, pizzastop1.com) does not disappoint on that front. The Pizza Stop has been holding it down on State Street since 1986, its New York-style, thin-crust pies among Rochester's best. A two-topping slice will run you a mere $2.50. Hell, you could even get a small pie with one topping for less than a Hamilton. The Junkyard Plate from Dogtown. Dogtown (691 Monroe Ave., 271-6620, dogtownhots.com) is a simple concept, brilliantly and dependably executed: hot dogs and fixings, with a startling number of vegetarian options. Start with a red or white Zweigle German frank and choose from more than 15 topping configurations, none more than four bucks. Dogtown also offers burgers, sausages, and other sandwiches, with meatless versions of nearly every menu item available. 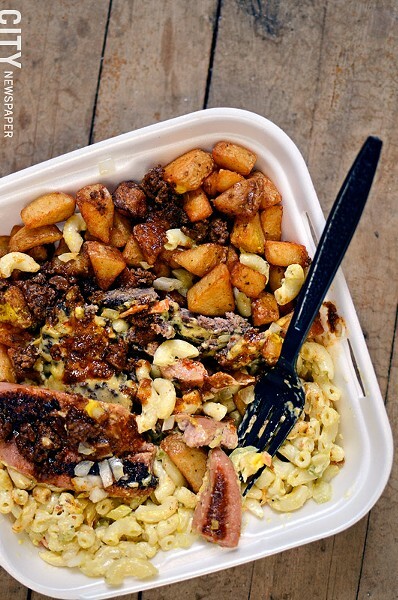 At $6.69, the Junkyard Plate is a good bargain; two dogs or burgers atop two sides, such as baked beans, macaroni salad, and crisp home fries that alone make the Dogtown version of the plate one of this city's finest. Natural Vibes Jerk Hut II (665 Culver Road, 360-4434, naturalvibesjerkhut.com) is housed in a cute, wood-shingled building near the corner of Culver and Atlantic, and its rustic feel perfectly complements the long-braised meats that anchor the dinner combos. The small size ($9) is more than enough for one meal, with protein options like jerk chicken, curry goat, and a flavorful brown stew chicken, served with rice and peas, plus a salad. There are a few non-meat options, as well as Jamaican breakfast classics like callaloo and saltfish ($9), served with dumplings, yam, and plantains. Hidden back in a little strip mall across from Monroe Community College is Chopsticks (125 White Spruce Blvd., 427-8878), a cozy Chinese restaurant with a Cantonese bent, as evidenced by its many rice dishes. The majority of the menu is under $10, but for an economical whole-meal experience, you can't go wrong with a combo (nothing costs more than $6.65 at lunch and $8.35 at dinner), which adds fried rice and a choice of soup or egg roll to a hearty entrée portion of favorites like beef with broccoli, spicy jo bo pork, or sesame tofu. A chicken gyro pita at Mark's Texas Hots. "Oh, let's just go to Mark's," my friends and I have been known to say when it's time to grub up, knowing that Mark's Texas Hots (487 Monroe Ave., 473-1563) will make everyone happy and leave us a few bucks for whatever happens next. A 24-hour diner, Mark's is a melting pot of locals, though you won't have too much time for people watching thanks to the quick and efficient service. You know the drill here — omelets, tuna clubs, grilled cheese, hot turkey sandwiches, and much, much more. 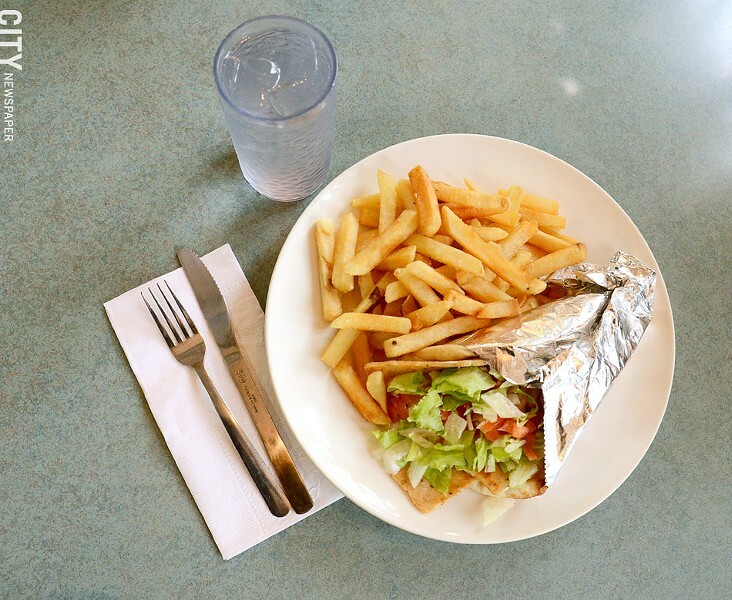 The chicken gyro pita is my favorite: thinly sliced meat, pillowy pita, lettuce, tomatoes, onions, and creamy tzatziki; with a side of fries (well done, of course) it's $5.75. Oh, one more thing: Mark's hot sauce rules. Named in honor of the year — and located on the site — that Susan B. Anthony was arrested for casting her then-illegal vote, 1872 Café (431 W. Main St., 730-7687, 1872cafe.com) is an airy, light-filled space whose walls pay tribute to crucial women in history. There's coffee, of course, in its many manifestations — along with comfy seating on which to enjoy it — but 1872 Café also serves a rotating menu of soups, salads, sandwiches, and wraps like the Sonoma ($6.95), with roast turkey, swiss chard, and provolone, topped with sundried tomato and roasted corn pesto. Look for comfort-food lunch specials and fresh baked goods as well. 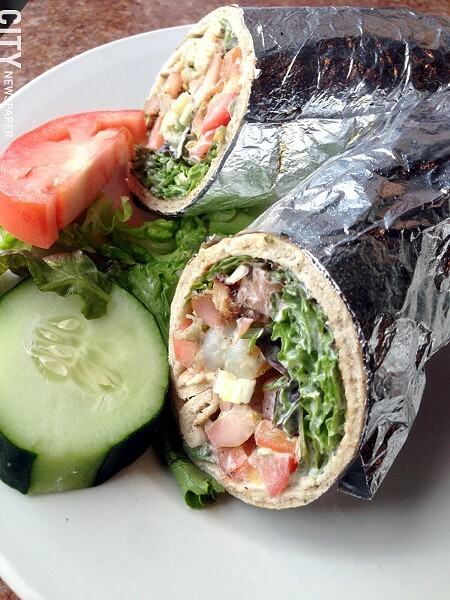 A chicken pita roll from Ticas with a Twist. A slice of lemonade cake from Kneel & Neal Southern Cuisine. You'll encounter some daily Costa Rican specials at Ticas with a Twist (280 Exchange Blvd., 319-3217), but the majority of the menu is Mediterranean, with starters like dolmades and tourlou, soups and salads, plus pita pockets ($6-$7) and pita rolls ($6.25-$8). The platters are a good value as well, with pastitsio, moussaka, and vegetable lasagna combos each coming in under $10. Bonus: beautiful waterfront views. Family owned and operated since 1929, Fox's (3450 Winton Place, 427-8200, foxsdeli.com) is a NYC-style deli with a good-sized menu of soups, salads, and sandwiches. Barely anything on the menu cracks a sawbuck, including the wildly popular Reuben ($8.79), which Fox's claims is the best in town. You'll also find builds like Bologna and the Beast ($7.79), which tops grilled bologna with hot pepperjack cheese and sautéed onions and serves it on rye, as well as the Sierrawich ($8.29), made of chicken salad topped with BBQ sauce, bacon, lettuce, tomato, and raw onion, and tucked into a hard roll. Opened this past July, Kneel & Neal Southern Cuisine (777 S. Plymouth Ave., 413-1943) serves down-home classics, like a fried chicken leg-quarter dinner with two sides for $10. (Sides include collards, candied yams, and macaroni and cheese.) But if you walk in with $10 and get one of the $6 specials — that's gizzards, rib tips, or four chicken wings plus a small side and a soda — then you'll still have enough money for that heavenly lemonade cake ($3). 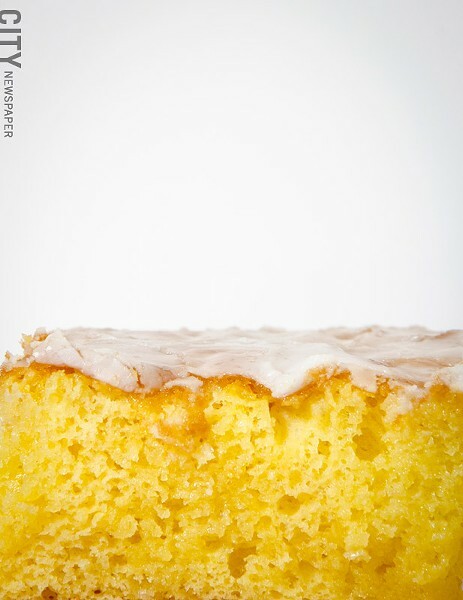 Served in squares only slightly smaller than a paperback, the fluffy cake is soaked in so much lemony goodness that it oozes out when you begin chewing. Actually, now that I think about it, you could just get three pieces of lemonade cake and call it a meal. Expanded to two more suburbs after the success of its original Irondequoit location, Monte Alban Mexican Grill (845 E. Ridge Road, 697-0615; 2245 Empire Blvd., Webster, 787-4700; 2160 Penfield Road, Penfield, 586-4134; montealbangrill.com) showcases a serious selection of Mexican-food favorites, with a whopping 20 lunch and 26 dinner combinations all for less than a tenner. (And that's not even including the half-dozen vegetarian combos.) I'm partial to Monte Alban's tomatillo-based green sauce and tender pork; at $9.99 either the tacos carnitas or burritos tipico — the former served with rice and beans, the latter with beans and guacamole salad — will typically do the trick. Banh Mi sandwiches from Whatta Banh Mi. A meal all on its own, the Vietnamese sandwich known as banh mi really has it all: crusty bread, juicy meat, spicy jalapeño, grassy cilantro, sweet-tart carrot, unctuous mayo. 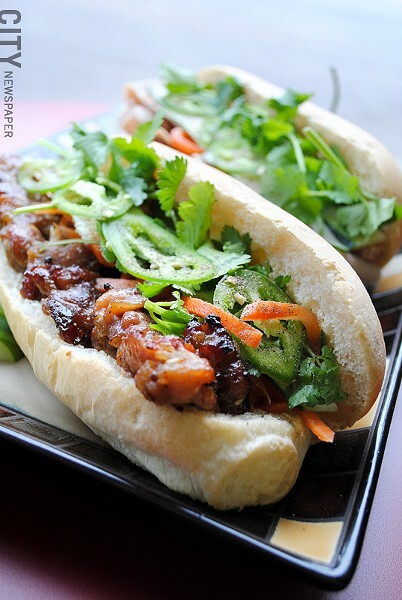 And as you can tell by the name, Whatta Banh Mi (673 Monroe Ave., 319-4831) specializes in these creations, offering up hot options like grilled pork and grilled curry beef as well as the traditional meat called Vietnamese ham, each priced at $5. Inexpensive vermicelli and rice dishes are also on the menu, as is pho, the popular rice-noodle soup that you garnish to your liking. A Rochester institution since 1949, Rocky's (190 Jay St., 232-9717, rockysonjaystreet.com) is an old-school red-sauce joint with zero frills. You probably won't get a printed menu; just a rundown of the day's offerings. And you may not even get a paper check; merely a total shouted to you from your busy server. In between, you'll be treated to crazy-cheap Italian food done right. A large linguine with red or white clam sauce is $6.50. A large gnocchi is $6. It's $7.50 for a large portion of homemade cheese ravioli. You get the picture? Check the website to see what Rocky's is serving, and be sure to bring cash, otherwise you're doing dishes. Got favorite place to get tasty, inexpensive food that's not mentioned here? Share it with us at by leaving a comment, below, or hit us up on Facebook (facebook.com/CityNewspaper) or Twitter (@roccitynews).